In early June, I make my first trip to the Caymans. 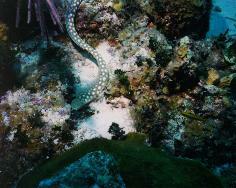 I discover that the Cayman Islands are a diver's paradise. My friend Maureen and her sister arranged a 5-day stay on Little Cayman. It is 5 days of being pampered as a scuba diver. The beginning of the trip is an eye-opening surprise. We needed to drive to the Tampa airport early in the morning to catch our flight to the Cayman's. That night, we notice a power failure, and we soon hear a utility truck doing repairs down the road. You can imagine my surprise when I go out to get the morning paper and find that it is MY front-yard water oak tree that had dropped an enormous branch onto the street and taken out a power line (ironically, I have just paid a tree surgeon $200 to remove a nearby branch that was threatening to fall). Large piles of logs and branches are piled high in my front yard and in the yard of my neighbor, yet I have no time to clean things up, as I have to run to the airport. I am pleasantly surprised to find not a single twig lying on the ground when I get back. The branch debris has been completely removed while I am gone. Our flight from Tampa takes us to the Miami airport. We then catch a plane to Grand Cayman (surprisingly flying over Cuban airspace), and are serenaded by a live reggae band playing at the entrance to the terminal. From Grand Cayman, we enjoy a very scenic 45-minute propeller plane ride from Grand Cayman to Little Cayman. The windows of the plane are enormous, affording us very impressive views of what lay below our flight (see photo above left). I happily snap photos of the very blue waters along the shorelines of Grand Cayman, Cayman Brac, and Little Cayman. The water colors range from deep blues to bright, glowing turquoise. We discover that the islands remain rather undeveloped (Little Cayman has only 100 permanent residents). Because of this, Little Cayman is very quiet and secluded-a true hideaway. It was not until a few years ago that the island was served by electricity from power lines. It is a great place to get away from it all. Landing at the Little Cayman airport is interesting, as the "runway" consists of gravel and grass. 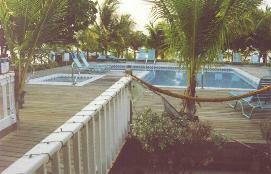 We stay at the very nice Little Cayman Beach Resort. 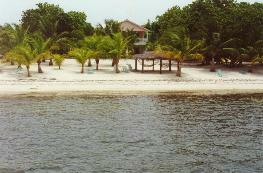 Boardwalks lead to the nearby dive boat dock, dive shop, dining room, swimming pool, jacuzzi (see photo at left), white sand beach, palm trees, volleyball court, bar, hammocks, basketball court, tennis court and gift shop. (One indication of how pleasant the trip was is the fact that the sand and boardwalks allow one to go for several days without ever putting shoes on.). 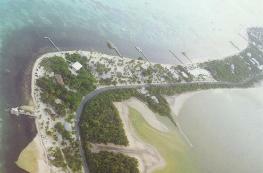 Our resort can be seen from the dive boat in the photo below left. Our dive package for our 3.5 days includes plane flights, 8 dives, lodging at the resort, and buffet-style breakfast, lunch and dinner. These meals are quite pleasant-in part due to the many different pies and cakes that were offered for each lunch and dinner. Our meals included such entrees as red snapper, flounder filet, crab salad, and several red meats (I do not try the red meats while there, as I am an aspiring vegetarian). Each meal has an assortment of side dishes and fruits. On the first day (evening), we stroll to the resort bar. I try the locally-made Stingray Beer. At $5 per bottle (the Caymans are expensive), I only have one. It is a mildly tasty beer. One night, we go out to the dive boat dock, and notice that several large tarpon fish like to feed next to the dock. Several swim to the surface and turn their silvery sides to us as they feed. There are 40-60 great dive sites along "Bloody Bay Wall" just off the coast of Little Cayman (less than one-quarter mile from the beach). The sites are only 25-35 minutes by dive boat. Bloody Bay Wall gets its name from the fact that a number of centuries ago, there was a great deal of pirate ship activity in the Cayman's. Efforts by the British Calvary of ships resulted in bloody battles with the pirates. The coral-filled wall is breathtaking. A short distance off the sandy beaches of Little Cayman, the wall drops steeply and to a depth of 6,000 feet. While there, we enjoy 9 excellent dives there. "Paul's Anchors" gets its name from a British calvary battle with the pirates. The pirates, trying to make a quick escape, cut their anchor lines. Today, several of those large, iron pirate anchors can be seen at this dive site. One we see appears to be about 20 feet tall. Later that day, we also dive "Sarah's Set" and "McCoy's Reef." I sign up for a night dive at "Soto Trader," which turns out to be the best dive I sample in the Caymans. In the holds of the ship, we see sleeping, blue and yellow, 60-pound parrot fish. I am able to drift down into many of the holds quite easily, as the openings are large. The ship sank in 1975. It was off-loading cargo, including diesel fuel. Some of the fuel ended up below in the ship holds, and efforts were made to use a pump to pump the diesel out. When the pump failed, crew members checked for faulty spark plugs. Testing a plug resulted in a spark that blew up the ship. Two were killed, and a of a ship hold went flying several hundred feet to the beach a long way away. The next day, we dive "Lea Lea's Lookout," which includes several extremely large canyons in the coral reef at the edge of Bloody Bay Wall. 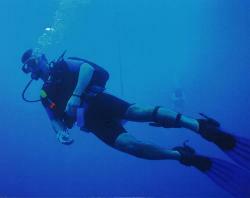 The dive includes visibility up to 100 feet. We also dive "Blacktip Boulevard," where we see lots of Garden Rays and Spotted Eagle Rays, and a snake eel (See photo top right) along the sandy white bottom of a portion of the dive. We finish the day by doing "Fisheye Funtasea," which features several fingers of coral reefs, and a number of turtles and rays. On our final day, we sample "Mixing Bowl," which turns out to be my favorite daytime dive. The dive features superb, coral reef-studded walls, several tunnels to swim through, and many fingered coral reef formations. 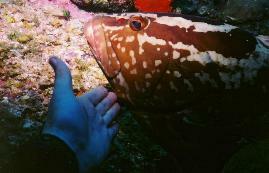 During the dive, I get to pet a large, friendly grouper who likes to hang out at the mooring for the site so that he can be stroked by divers (photo below shows a friend reaching out to him). Our last dive was "Great Wall West." There, we first swim out to the shear drop-off of the wall. A 90-degree drop straight down. The 6,000 feet to the bottom of the wall means that when you look over the edge, you see dark blue water and nothing else. Eerie. Swimming out about 40 feet and looking back, I enjoy taking in the immensity of the Great Wall. It is enormous. We swam along the edge of the wall, which is covered with colorful coral and tropical fish-many of which are confused and swim along the side of the wall as if it is the ocean bottom. Holes and crevasses along the wall contained large lobster, resting fish, and a big, long-legged crab. A photo of me doing a "decompression safety stop" on one of the Cayman dives is at the bottom right of this page. The coral reefs contain over 100 different coral species and more than 500 types of fish. While there, we check out a bird sanctuary (Booby Pond Nature Preserve) which is home to 5.000 pairs of red-footed boobies (the largest colony in the western hemisphere) and 1,000 magnificent frigate birds. Unfortunately, the pond in the sanctuary is mostly dry due to a recent drought. We see a number of large rock iguana-up to five feet long-roaming the island (photo above left). Roads caution that "Iguanas Have Right of Way. Drive Slowly." 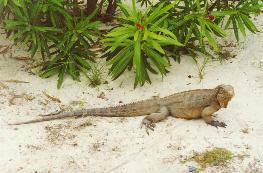 Approximately 2,000 iguana inhabit Little Cayman.